Calling it “gold medal research at its best,” the Honourable Gary Goodyear, Minister of State for Science and Technology, yesterday announced the formation of three new Networks of Centres of Excellence (NCE) – including BioFuelNet Canada, which will be led by Don Smith, James McGill Professor in the Department of Plant Science. The two other Centres are the Technology Evaluation in the Elderly Network, based at Queen’s University; and the Marine Environmental Observation, Prediction and Response Network, based at Dalhousie University. In all, the government is investing $73.8 million over the next five years to fund the networks – money well spent, said Goodyear. 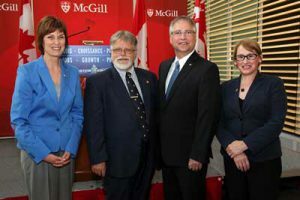 Calling it “gold medal research at its best,” the Honourable Gary Goodyear, Minister of State for Science and Technology, yesterday announced the formation of three new Networks of Centres of Excellence (NCE) – including BioFuelNet Canada, which will be led by Don Smith, James McGill Professor in the Department of Plant Science. The two other Centres are the Technology Evaluation in the Elderly Network, based at Queen’s University; and the Marine Environmental Observation, Prediction and Response Network, based at Dalhousie University. In all, the government is investing $73.8 million over the next five years to fund the networks – money well spent, said Goodyear. Funding was awarded to the three new NCEs following a competition to assess applicants’ research proposal, training program, level of networking and partnerships, knowledge-transfer activities, and management. BioFuelNet Canada will receive close to $25 million from the NCE program. With close to 100 researchers from almost 25 institutions across Canada, the network includes most of the researchers who are working in biofuels in the country. They will be divided into four regional platforms (West, Prairie, Central, and East) that will focus on the sources, conversion processes, uses and sustainability practices that are most appropriate for each area. At the same time, by being integrated into a national network, investigators will benefit from the synergy of the shared research process. NCEs are large-scale, academically-led virtual research networks that bring together partners from academia, industry, government and not-for-profit organizations. For more than 20 years, the NCE program has successfully brought together the best minds in many disciplines and sectors to find solutions to critical issues for Canadians, and has leveraged more than $386 million in industry cash and in-kind support. BioFuelNet Canada, will be housed in Montreal’s Griffintown district at the new Quartier de l’Innovation – an ambitious partnership between McGill and École de technologie supérieure that brings together academic programs, student internships, entrepreneurs, established industries large and small, technologies, and the support services required to coordinate and sustain them.